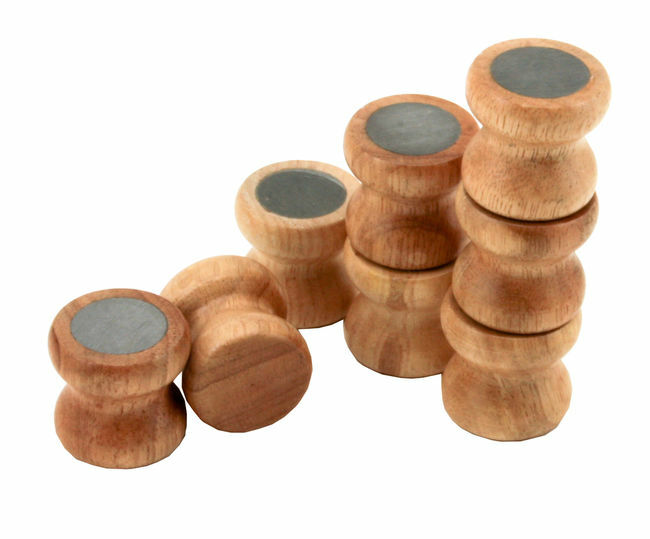 85 gram Hardwood bobbins. Sold individually. 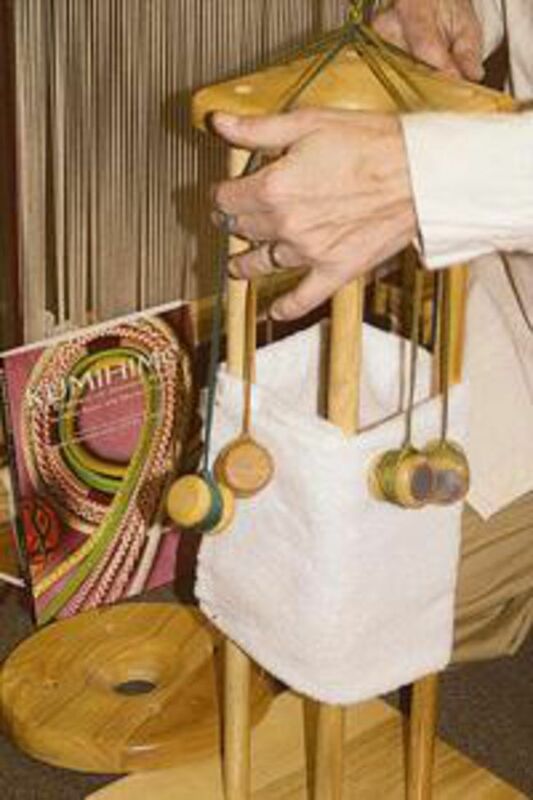 This unique stand, specifically designed for Kumi Himo braiding techniques is easily converted to either Kakudai, square platform suitable for the popular 8 strand braids or the Marudai, round platform suitable for braids requiring up to 32 strands. Weights and book in picture not included, just the stand. 24" high, fine hard clear finish. 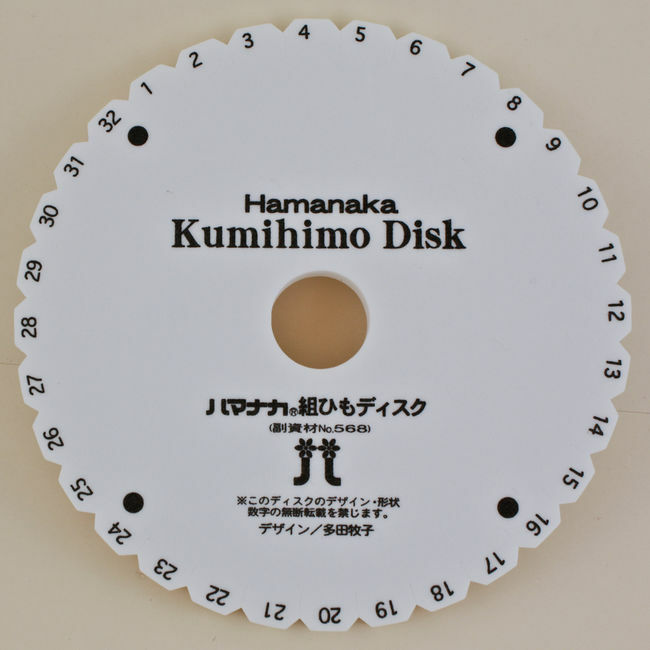 Kumihimo disk is perfect for beginners who want to make braids or experienced braiders who want to make samples. Disk is 6" diameter and 3/8" dense foam. Perfect for a portable project. No image yet for item 6840006I. Instructions for kumihimo braiding on a disk. Printed in color, two pages for eight end round braids, one eight end flat braid and sixteen end round braid. 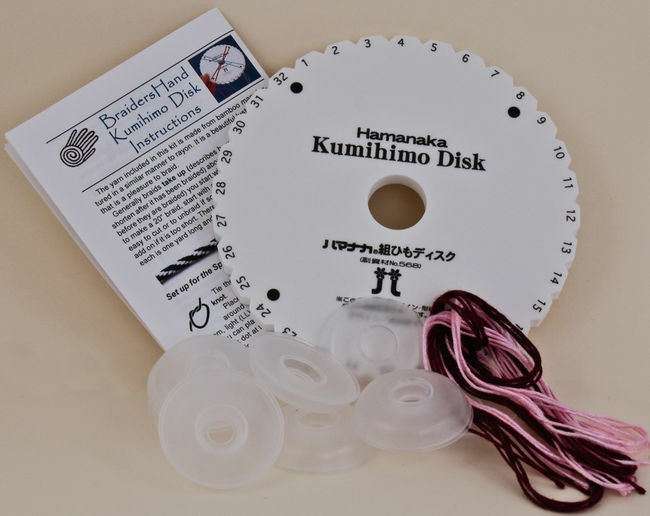 Kumihimo disk kit is perfect for beginners who want to make braids or experienced braiders who want to make samples. Disk is 6" diameter and 3/8" dense foam. Perfect for a portable project. Kit includes disk, instructions, 8 - EZ bobs, and yarn (8 strands 1 yard long). 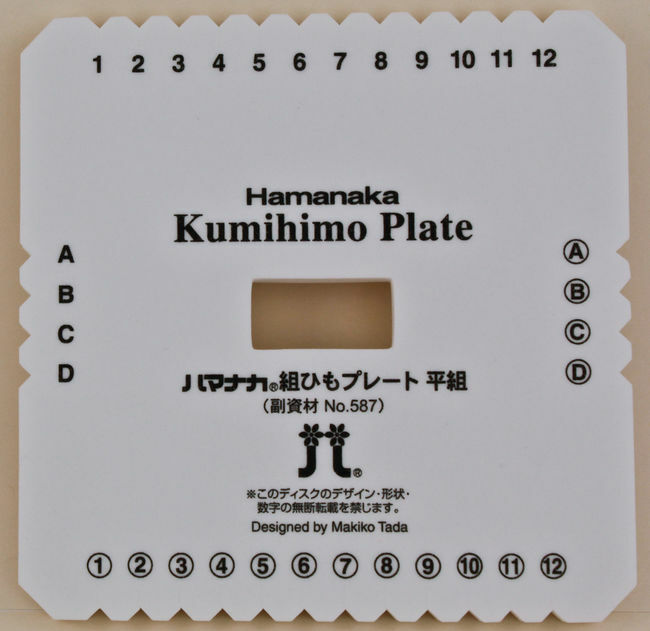 Kumihimo plate is perfect for beginners who want to make braids or experienced braiders who want to make samples. Disk is 6" square and 3/8" dense foam. Perfect for a portable project. No image yet for item 6840007I. Instructions for kumihimo braiding on a plate. Printed in color, two pages for six braids, including zig zag braid. 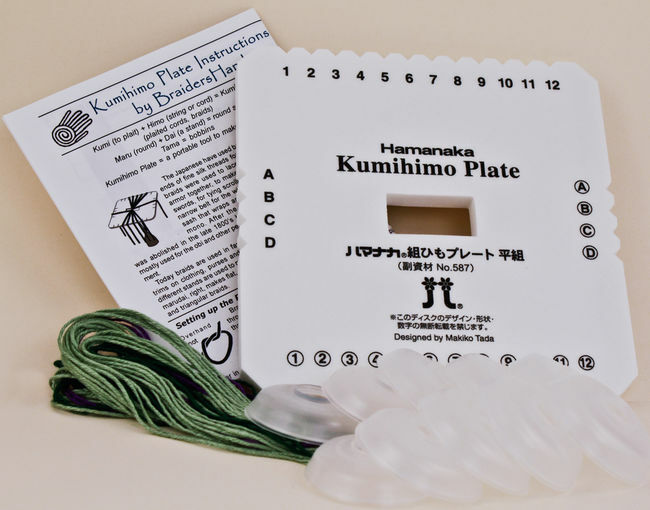 Kumihimo plate kit is perfect for beginners who want to make braids or experienced braiders who want to make samples. Disk is 6" square and 3/8" dense foam. Perfect for a portable project. Kit includes disk, instructions, 8 - EZ bobs, and yarn (8 strands 1 yard long). Kids love this as a toy. 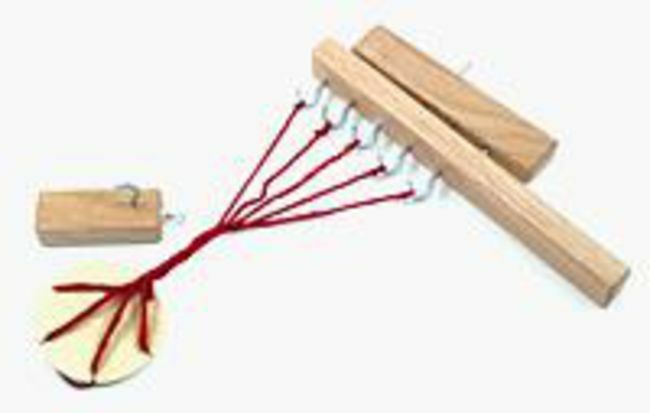 Moms love it as a way for kids to use up yarn bits constructively. Fiber artists love it for the beautiful multi-colored ropes they can make to trim their projects. New rounded shape makes rope making smoother and easier. Works best with two people, great project to have kids help with! Fancy cords and ropes can be made on this machine ranging from 2-5 ply. 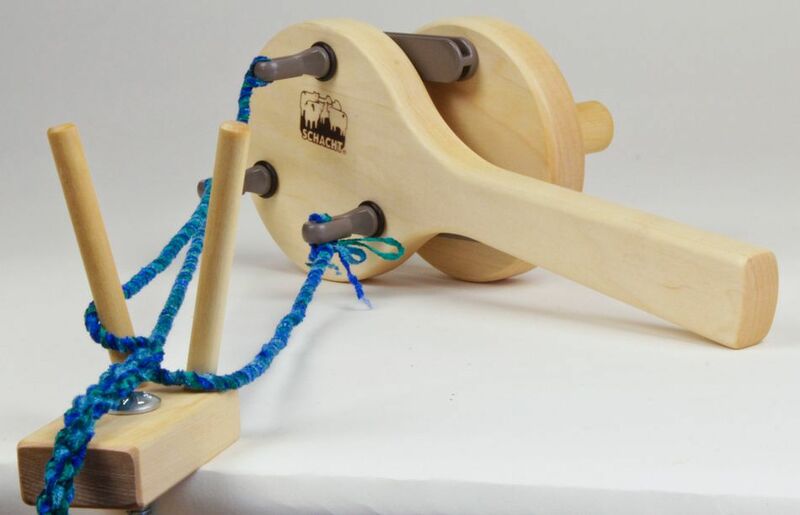 This rope maker can be operated by hand or power drill with speed control.